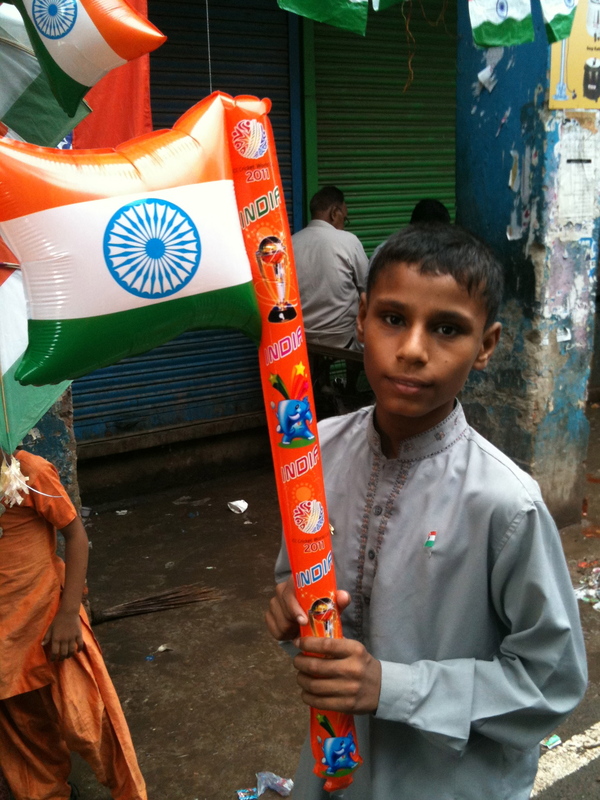 On India’s 64th Independence Day on Monday I woke to a text message from Old Delhi friend Amit: “Rain has played spoil sport”. I looked out to see the Monsoon rains sheeting down and felt his pain. Normally rain is met with joy and relief in North India. 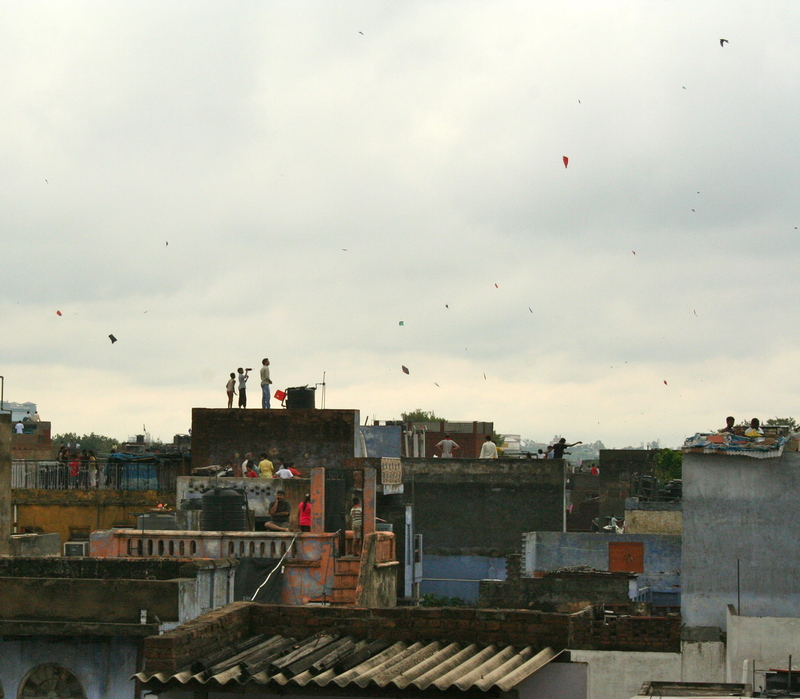 In Old Delhi, though, Independence Day is celebrated by flying paper kites, a symbol of freedom – rain means the festivities will be a wash out. 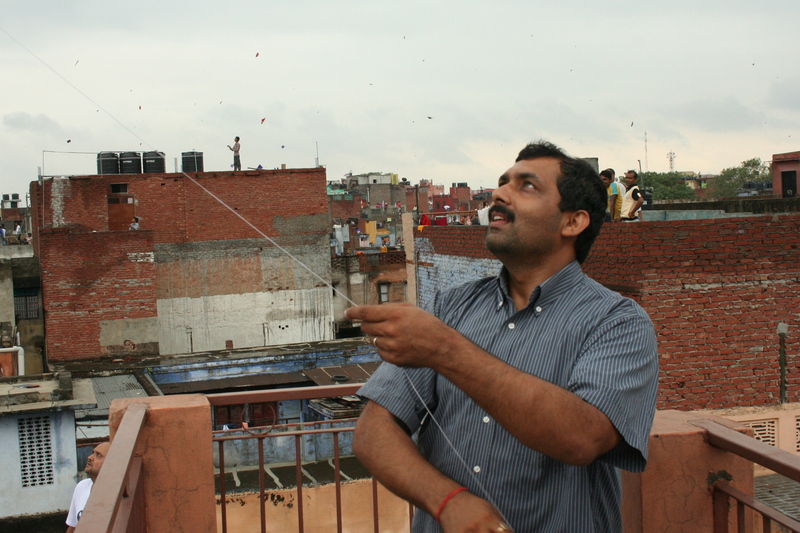 (There’s a nice piece here on the tradition of kite flying in Old Delhi, with pictures by my friend Simon de Trey White. 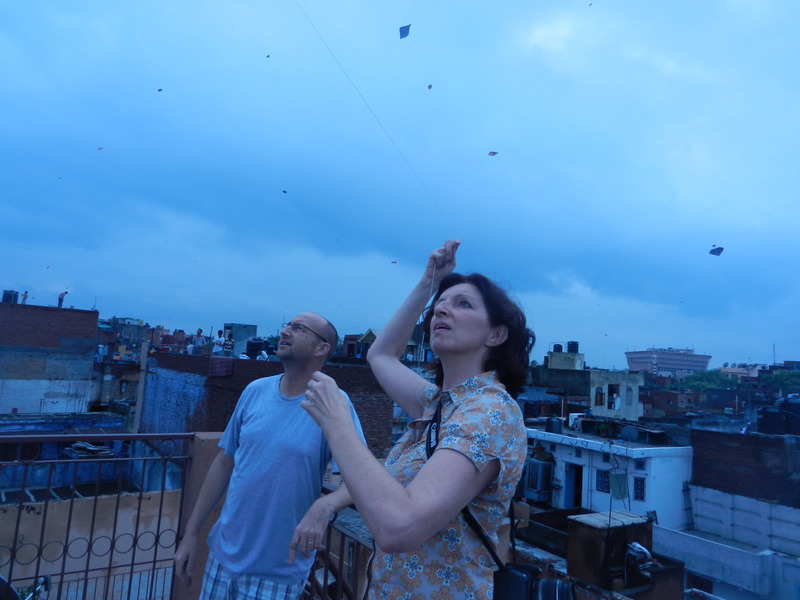 I was particularly disappointed because this was the first time I’d been invited to take part in not one, but two kite flying parties in Old Delhi. Happily, by noon the rains had petered out and I headed off. 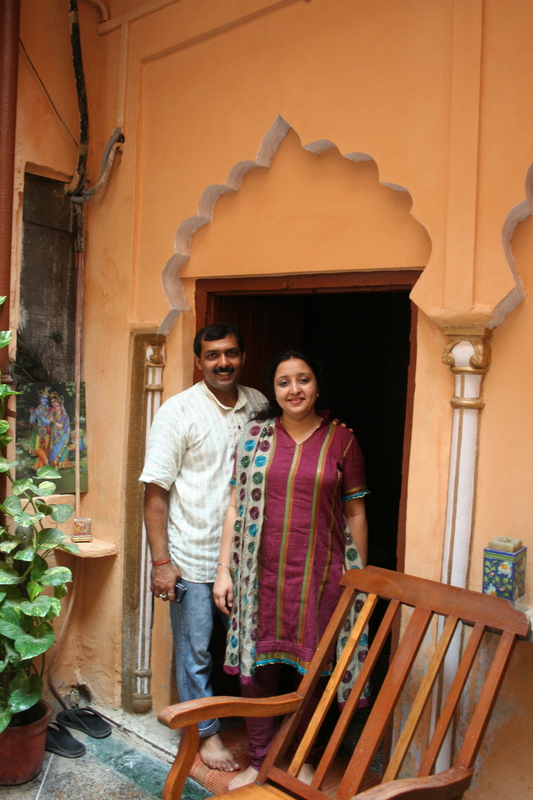 The first stop was the beautiful haveli owned by Dhruv and Richa Gupta in Sitaram Bazaar. I’ve just recently come across the Guptas, a lovely couple who have decided to open up their family home to visitors. Dhruv, born and brought up in ‘Master-ji Kee Haveli’, is on a mission to show people a slice of real life in the old city. 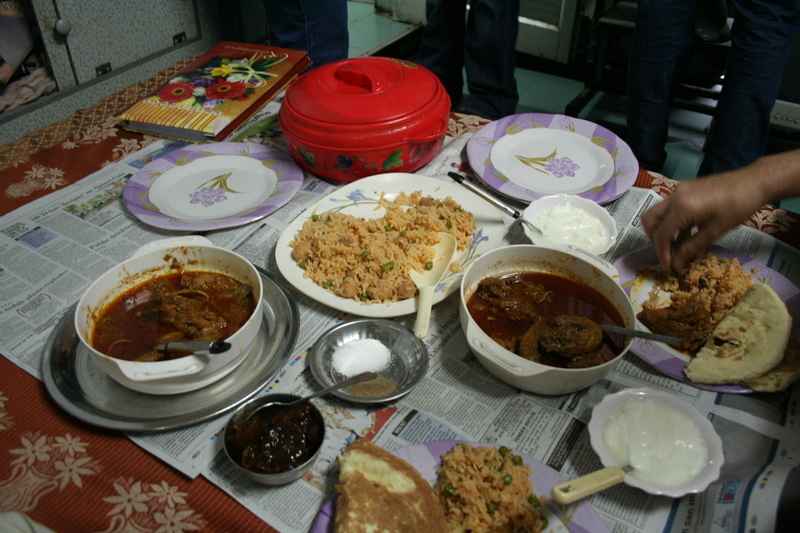 He takes groups on guided walks around his neighbourhood, sampling street food and giving an insider’s view of life in a traditional Hindu community. Guests can also spend time at his home – one of Old Delhi’s last single family-inhabited havelis – and even stay for a meal. 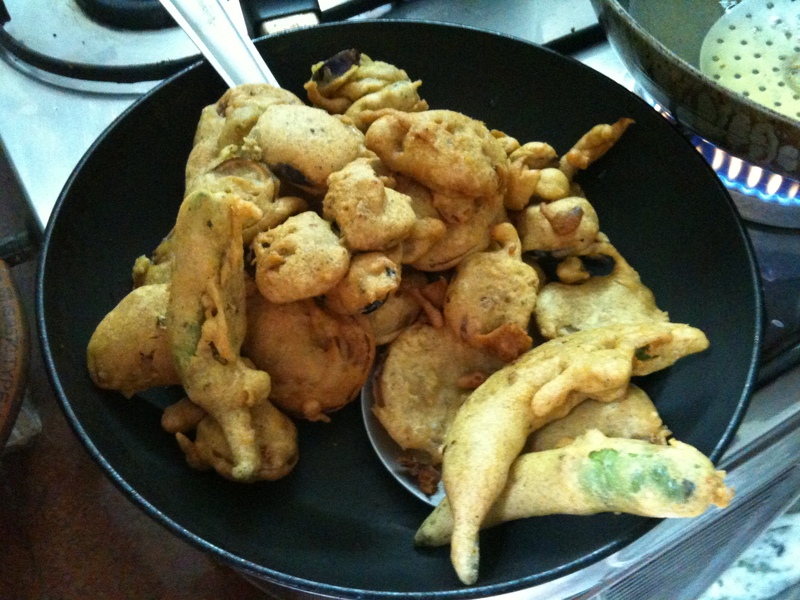 On Monday I arrived in time for some monsoon favourites: pakoras, fried potatoes, dhokla and spicy chai, all made by Richa – perfect food for grey skies and watching the rain pattering down in the haveli’s courtyard. 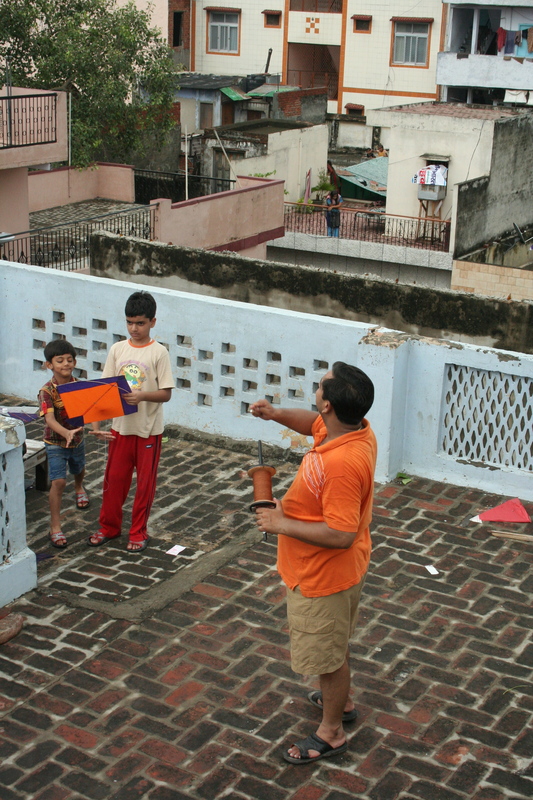 After our snack, we went up onto the roof of the haveli and Dhruv showed us how to fly our kites and bring down other people’s. 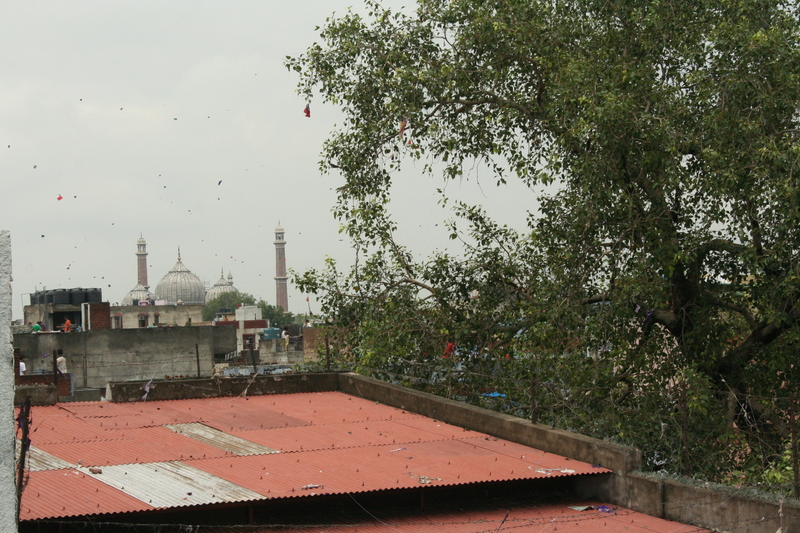 It seemed like the whole of Old Delhi was on the roof. The glowering skies and Jama Masjid in the distance were a dramatic backdrop to the multi coloured kites – I could happily have whiled away the whole afternoon there. 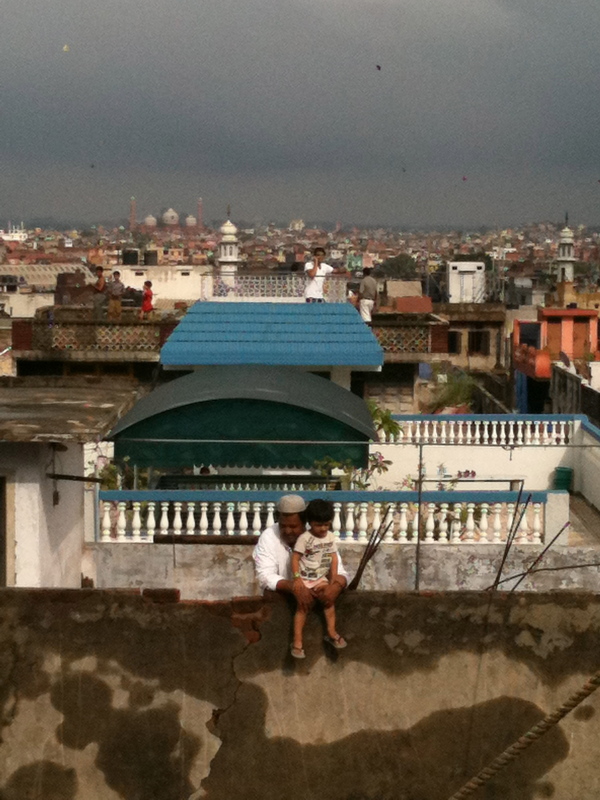 But over in Sadaar Bazaar another rooftop, belonging to Amit Arora, was waiting. We weren’t allowed on the roof, though, until we’d all sat down to a slap-up meal on his mum’s bed and flicked through the family photo album. Amit’s a member of the legendary Ashok and Ashok family and knows a thing or two about slap up meals, so we were happy to delay the kite flying. I, however, just managed to look anxious and inept. All in all, a great day – an insight into one of Old Delhi’s oldest traditions, a glimpse of life in one of its beautiful havelis and a meal with the family behind one of its most celebrated dishes. I love my life – Happy Independence Day! Very well written.. I wonder sometimes writing is such an essential part in our life.. After reading this i feel so attached to delhi and india sitting here in canada… good work pamela.. i am a web designer by profession and have created several sites including blogs but have hardly found any reason to start my own blog.. and now i guess i should…. 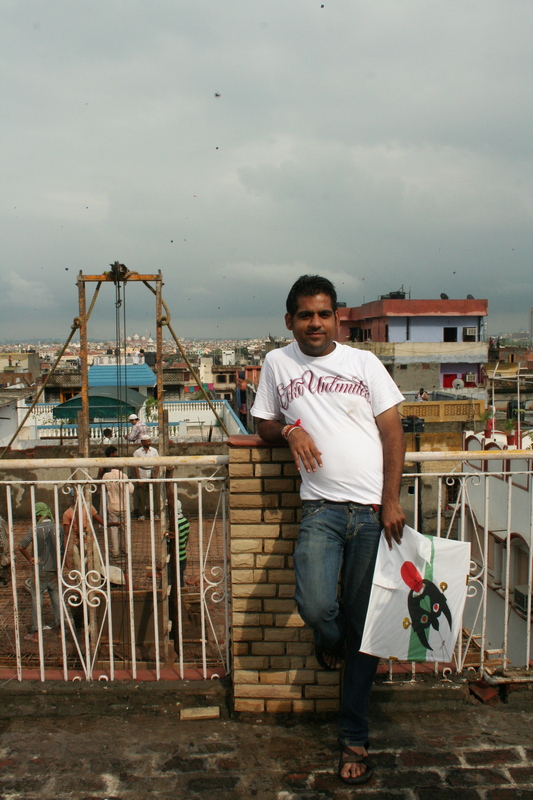 and about amit (my brother).. he has a very kind heart and is a gem of a person… have a nice day all of you…. i had read masterji kee haveli, family and the tour. That’s awesome!! I would really like to try this one. it’s wonderful for them to invest in tourism. People should support to protect the heritage, culture and traditions to others especially the future generations otherwise we will be living in a world where nature can only be appreciated in pictures, cultures and traditions could only be experience in films. People should really learn and support these kind of ventures and causes for the best of their country, not in some mining, or other industries that could ruined the natural beauty of it..
What a special day ! Mine was graced by the presence of a wee snake by my desk which I can only interpret as bountiful good luck. Very nice article… I just loved it. I have left India many decades ago and I miss the Old City and delicious food, culture and Havelis.. We also had one Haveli and with time it was divided in family and finally sold out. I am happy that there are still few people who value these Old Havelis and make effort in maintianing the original structure. I love this post of yours. You make me miss Delhi way more than I imagined. I admire you for opening your heart out to my country and embracing it as it is – the good, the bad and even the ugly. Loved this post and sharing your day.